After the world-conquering 1984, frontman extraordinaire David Lee Roth decided follow his own happy trails towards a solo career and left Van Halen with a big-time dilemma. Replacing a singer in any band is hard enough, but when said band is already a million-seller with an established fan base and one of the biggest names in rock history, the odds may be stacked against you. AC/DC (and arguably Black Sabbath when talking about the first of their many switches on the mic) could serve as an encouraging example, but bands exemplifying the opposite career-direction in a similar situation were certainly more numerous. Enter Sammy Hagar, the palm-headed red rocker who Eddie Van Halen had allegedly met at random while getting a mechanic to work on his Lamborghini, and who had already tasted success while fronting Montrose and afterwards with some solo hits of his own – a dam fine pick in my books. Because first off, no one could beat DLR as the ultimate front man. From his charisma and on-stage acrobatics to his witty banter and one-liners, Roth’s turbocharged-Robert Plant-act was the blueprint that every big-haired 80s rock band front man tried to emulate but couldn’t match. The only hole in Roth’s game was that his singing, while doing the job, wasn’t anything special. Sammy Hagar was ten times and then some the pure singer that Roth was. He's got his own kind of blue-collar flamboyance and while it's not on par with the over-the-topness of Diamond Dave, he’s got pipes up the wazoo and is undoubtedly one of my favourite rock singers of all time. His natural voice is in the slightly lower range with a little gruff to boot but he can take that sucker to high places. 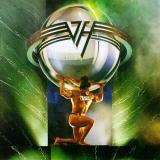 On Van Halen’s first album following the singer-switch, 5150 (a title taking inspiration from the California police term for a mentally disturbed person), that edge along with some damn good tunes go a long way in keeping the band’s reputation strong. Although it’s perfectly understandable if the fans already turned off by Roth’s departure wouldn’t like 5150. The synthesizers that were brought into the mix more heavily on 1984 have maintained their position and the clear n’ powerful yet slick production job can give weight to claims of the band going “corporate” that I’ve seen from time to time. I could see Good Enough placed as the opening track to calm down the worried ones with the kind of fast-paced, mildly suggestive/sexist party-time rocking that Van Halen is superbly known for. Alex Van Halen’s frantic drumming rolls nicely, Michael Anthony’s piercing background wails rule and Eddie Van Halen’s scorching lead guitar is as magnificent as ever. It’s also a good bumper to lead into the album’s mega hit, the synth-dominated Why Can’t This Be Love. Even poppier than I’ll Wait from the previous album, I think this could be the one to really grind the wrong way with old VH-fans. Personally I think it’s a really catchy tune but not that special among the best of this album. A rapid pace roller follows with Get Up and brings out an excellent trio of fastish-yet-somewhat-mid-tempo anthems in Dreams, Summer Nights and Best Of Both Worlds. Unforgiving in melody and catchiness, these babies will stay in your head, with Eddie’s solo in Dreams taking the biggest cake from me. Speaking of cake, the mandatory 80s power ballad in here, Love Walks In, is without a doubt the sappiest, most syrupy thing Van Halen had written thus far but I’ll be damned if it isn’t catchy as hell as well. The title track brings forth more straight-forward rocking to drink with, while the closing track Inside could be considered the odd one out of this batch. Synth-driven and a little sinister in tone, it feels like the guys were looking for the kind of dark, moody atmosphere that made the Fair Warning-album stand out in their earlier catalogue and wanted to mix it up with their modernized sound. It doesn’t fall flat but still is just a somewhat weird song amidst the fist-pumping action that takes up the majority of the album. Overall, 5150 is a great record made in a situation of tremendous pressure, considering the status of the band in the rock scene and the personnel change that was freshly introduced to the world - an introduction that lead to a Billboard #1-slot and more million-sales. While David Lee Roth’s chuckle-worthy proclamation that “Old Van Halen, when I was in it - classic Van Halen - makes you wanna drink, dance and screw, right? And the new Van Halen encourages you to drink milk, drive a Nissan and have a relationship.” can be easily understood based on this album alone, it doesn’t take anything away from the enjoyability of the material. Like many fans, I’m often semi-humorously inclined to call the band that made the albums which were released between 1985-1995 “Van Hagar”, but that is merely due to the band having such a decidedly different feel than they had with Roth. Admittedly, when pressed with the question, I would pick DLR to front Van Halen forevermore, but I would just as assuredly recommend all hard rock-fans to get to know the Hagar-era Van Halen as well. It’s awesome, just a different kind of awesome, and 5150 is a very good choice to start with.